tanking weapon – Welcome to Spinksville! Which are the most popular Wrath instances? via Jacob, a commenter on Tobold’s blog, who set out these numbers and piqued my curiousity. There are twelve instances in Wrath that can be run as heroics. But not all heroic instances are equal, some are very much more popular than others. And here are some stats to prove it. The numbers here are gotten from checking how often each end boss was looted in heroic mode from wowhead. So these numbers only reflect the experiences of wowhead contributors – they also don’t account for the people who attempted an instance but weren’t able to kill the last boss. However, it’s still a large sample size. So everyone really does hate the Oculus. In previous expansions, instances were tied to reputations. So if you wanted a particular reputation reward, you were forced to run the right instances for it. In Wrath this is no longer the case. You can just wear the tabard from the faction you’d like to champion and you will win reputation for them wherever you decide to go. This means that players are much freer to pick their heroics on other criteria. Note also that each heroic can only be run once a day, due to lockouts. An instance will be more popular if it’s either seen to give a better time: reward ratio, if it’s easier to find a group to go there, or if it’s just more fun. It may also be more popular if there is some rare instance-specific drop that many players will want. Everyone hates the Oculus. It’s not seen as fun, it’s hard to get groups there, and there’s no special drop that would lure people into it. Oculus is an unusual instance because you have to use vehicles (flying drakes) to fight the last boss. But the second and third bosses are also quite tough. Annoyingly, if you die on the last boss, there is a possibility that you’ll fall so far off your drake that not only will you die but also zone out of the instance. This would mean missing a chance to loot the boss even if your group does kill it. So not only is it a long ride from Dalaran, the bosses are hard, the vehicles are odd, and there’s a non-zero chance that you will miss out on some rewards. The easiest instances are the most popular. Violet Hold, Utgarde Keep, and The Nexus are widely known as the easiest heroics. So the risk of a group not being able to finish them is lower, and they’re very popular. Violet Hold in particular is right in the middle of Dalaran and also quick to run. So an instance that’s quick, easy, and convenient is also popular. The Nexus is not convenient, it’s a long ride from the middle of Northrend. But it has some other redeeming factors. It’s relatively easy, it’s one of the instances which has an extra boss in heroic (ie. an extra badge/ extra loot) and there’s also the possibility of a good epic healing mace dropping from the last boss. So healers are usually keen to go there. As a corrolary, the hard instances are less popular. Halls of Stone, Halls of Lightning, and Ahn-kahet are harder heroics, or they contain at least one encounter that’s notorious among the player base. So whether or not they really are more difficult, the players have the perception that a PUG to those places is less likely to succeed and will likely pick somewhere easier to spend their limited time. I think Ahn-kahet is getting a raw deal here. It’s really not that bad and also has an extra boss in heroic. But still, the perception is there. If an instance is the subject of the heroic daily quest, there will also be more player interest. The daily tips the effort/ reward ratio for that instance. But I’ll assume that dailies, being random, apply equally to each instance. However, if an instance is also the subject of a normal daily, that also adds an extra reward. And only 5 of the twelve instances can be attached to a normal daily quest. Oculus, Stratholme, Halls of Lightning, Halls of Stone, and Utgarde Pinnacle. These include some of the least popular instances. So having a daily quest doesn’t make an instance more appealing, even though it adds a fair amount of cash and reputation as a reward. There are a couple of instances where the numbers puzzled me. Drak’Tharon: I would include this as one of the easiest heroics. Yet, it’s barely more popular than Gundrak and Azjol-Nerub which are both harder, and not any more convenient to get to. So people just don’t know that it’s easy? Or is it simply that if they have limited time, they’ll run a couple of the easier heroics and Drak’Tharon just isn’t on the top of anyone’s list? My guess is that it just lacks some fun. It’s not a bad little instance at all. Utgarde Pinnacle: Probably one of the harder heroics because of the gauntlet at the third boss, but also one of the most popular. It’s not at all convenient, but there are a few factors luring people out there. It’s next to Utgarde Keep which is easy. Contains an epic tanking weapon, so paladins and warriors (and dual wielding death knights?) are very VERY keen to go there. Do tanks get a raw deal? This is not the first time that Blizzard, in their wisdom, have put an epic tanking weapon on the end boss of a heroic and given no other crafted options for tanks who don’t fancy running it a lot. They did the same thing in The Burning Crusade. This does apply to feral druids also, but they luck out here because their epic tanking weapon drops from the last boss of Violet Hold. Which is easy and also very popular. 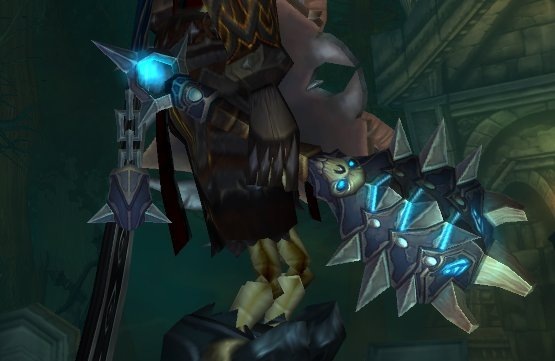 By comparison, healers can grab a good crafted epic mace to get them started, and casters and melee dps have options among the reputation rewards. We do get the option of a nice crafted epic shield. But you can also pick up a good shield with heroic badges which people will get anyway. There’s no decent tanking weapon available as a reputation reward, epic or not. It continues to be a theme for Blizzard to encourage the support roles into heroics.